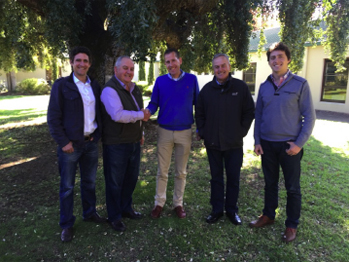 Dutoit Group of South Africa has taken position in the well established Fruit Company, Nico De Jong B.V. of the Netherlands. Pieter du Toit, Managing Director of the Dutoit Group describe this transaction as a strategy to bring producers closer to the European (EU) retail trade with added value at lower cost. "We have full confidence in Alfred de Jong and his team to use this new platform to the advantage of both suppliers and the EU retail trade". Alfred de Jong, Managing Director of NIco de Jong BV commented that after building the company for nineteen (19)years this transaction brings a new perspective of growth as member of the Dutoit Group. "As we are the source now, we have to build a long term customer relationship programs with our EU partners and to transfer their needs to get the best fruit for them". As a category service provider Nico de Jong will add value to the supply chain for overseas fruit at the lowest cost and control the quality for the EU customers on specification.